Chishima Province (千島国, Chishima-no kuni) was a old province of Japan north of the island of Hokkaido. 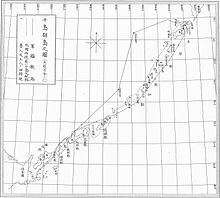 It included islands which are commonly known as the Kurile Islands or Kurile Islands. The history of the province started in 1869 and ended in 1882. The boundaries of this ancient province are generally mirrored in part of what is today called Nemuro Subprefecture. After 1869, the northern Japanese island was known as Hokkaido. Regional subdivisions were established. Chishima Province was one of the new entities which were created in 1869. In the Meiji period, the provinces of Japan were converted into prefectures. The maps of Japan including Chishima Province were reformed in the 1870s. In 1882, Chishima and the other ten provinces of Hokkaido were reorganized as Hakodate Prefecture, Sapporo Prefecture and Nemuro Prefecture.